The Knowles family in Cowfold are certainly taking their rearing and growing very seriously. The focus of Trenchmore Farm is, without doubt, the striking herd of Sussex, Wagyu and Angus cattle. The resulting beef from the crosses is gaining a reputation for being amongst the best in the South, certainly our top local chefs must think so as their demand increases. 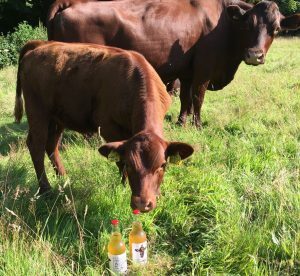 Of course, when you also have an orchard hosting hundreds of apple trees, your cattle rather enjoy any time they spend eating the windfalls which gave rise to the farm’s aptly named Silly Moo cider. As Silly Moo demand began to outstrip supply of the cider apples on the farm, the family started a scheme for people to bring in their unwanted apples in return for bottles of the giggly apple juice! 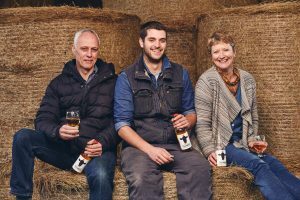 The latest venture from this very special Sussex farm is one that the area has been crying out for – heritage wheat. 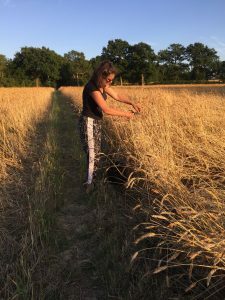 The crop this year has been stoneground to create a quality strong flour and is also available as wheat berries which, we are told, prove very versatile and a great alternative to rice. Come & meet some of the family at Crates in the Carfax this Saturday from 2pm. 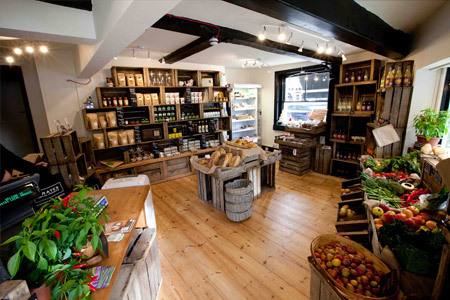 You will be able to sample their (not so) Silly Moo cider and talk all things farm!